Ever since Intel's launch of its new CPU generation, the Core 2 processor, there has been a lively discussion about the performance of this new chip. 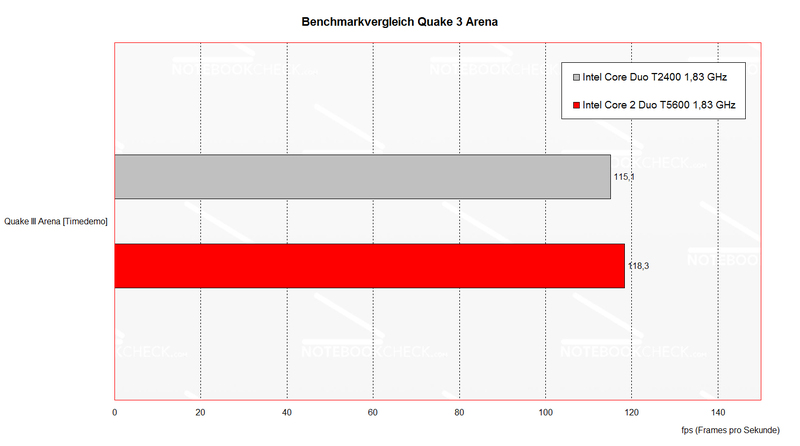 We had the chance to compare both processors in the same notebook. Thanks to chiliGREEN, we had the chance to directly compare a Core Duo processor with a Core 2 Duo CPU of the same clock rate in the same notebook. 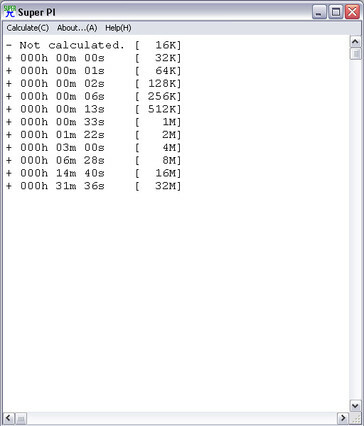 One can exchange both processors without big problems, because they are based on the same chipset. But one should consider that processors of a higher clock rate might lead to essentially more waste heat. 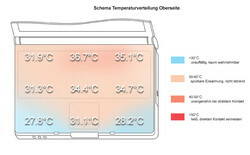 Therefore, it could cause problems, if the cooling system is not designed for higher temperatures. 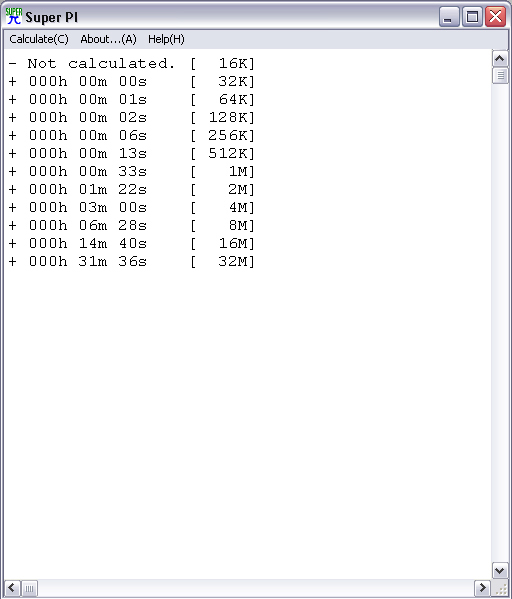 Furthermore, a processor of higher performance will cut down the battery runtime. 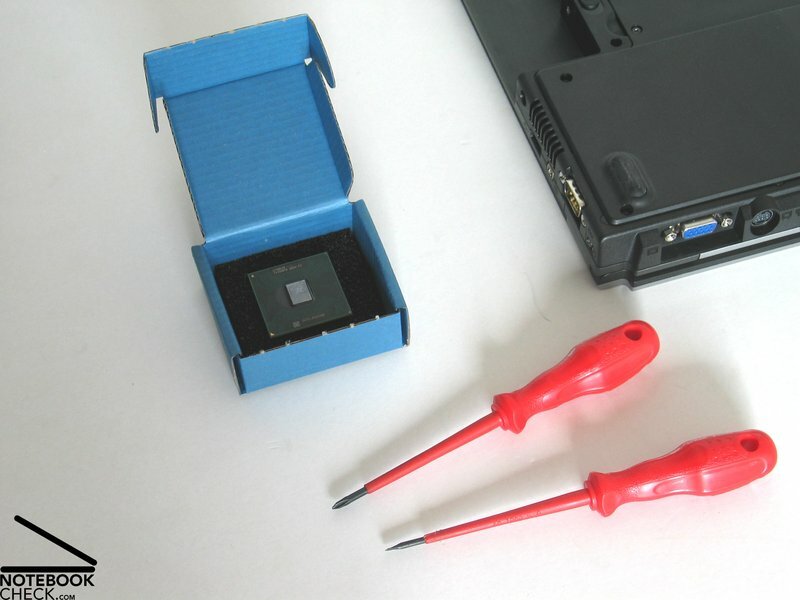 The following pictures show the disassembling of the CPU. 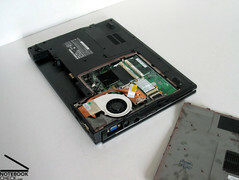 Prior to the removal of the processor, the notebook must be turned off and the battery must be removed. Step 1: Turn off the notebook and remove the battery pack. one needs a screwdriver and a Phillips-tip screwdriver. Step 2: Remove the screws and the cover. 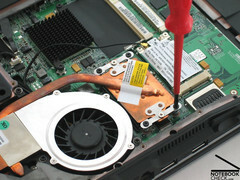 Step 3: Remove the screws of the heat sink. Step 4: The heat pipe can be removed. 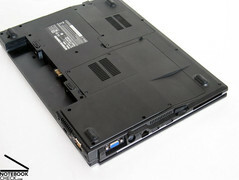 In the reviewed notebook, there is a heat sink pad. 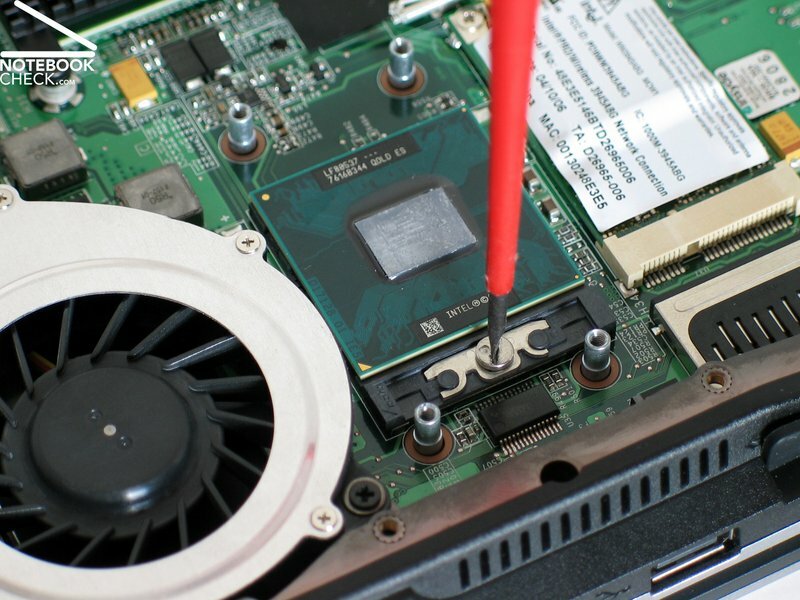 After the processor has been removed, the new CPU is placed (Take care of the direction! 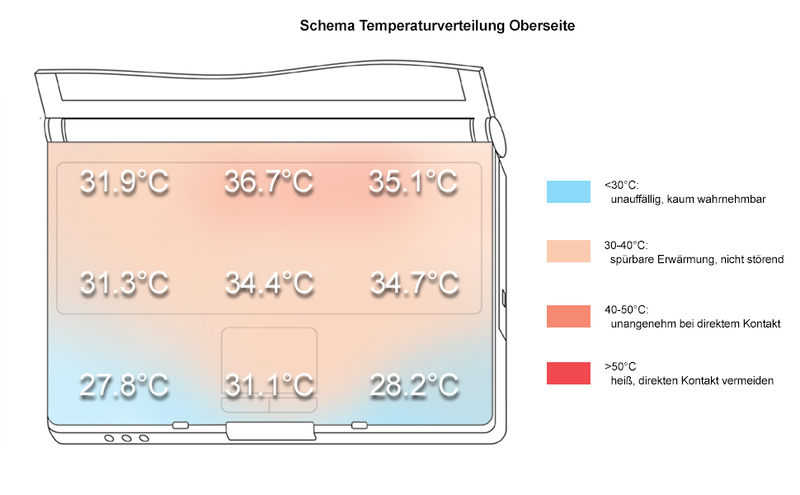 ), the heat pipe is fixed and the notebook is closed. 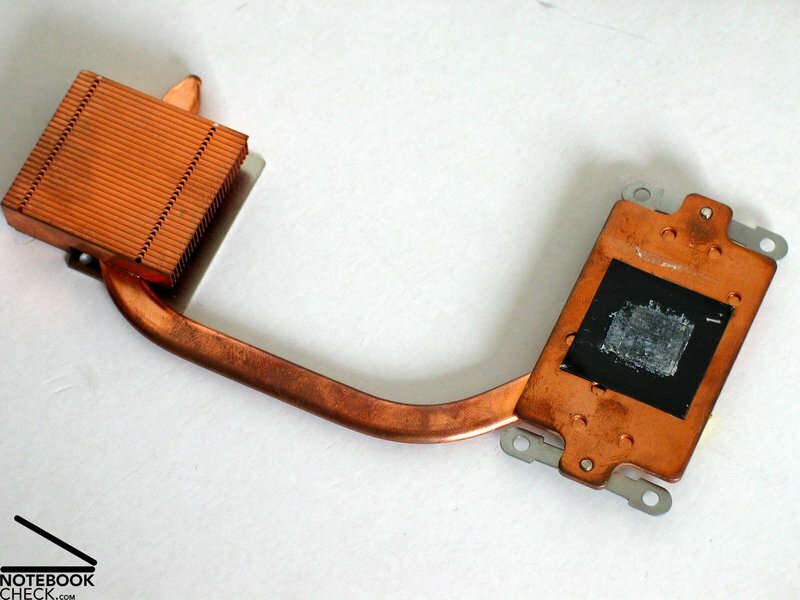 (If the cooler is not equipped with a heat sink pad, some heat sink compound must be put on the CPU. For further information on this topic, consult the handbook of your notebook or the manufacturer. 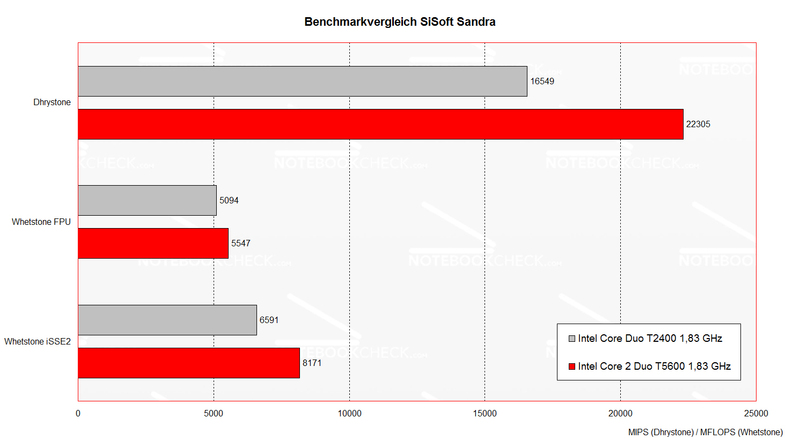 Following are some benchmark tests of both CPUs. 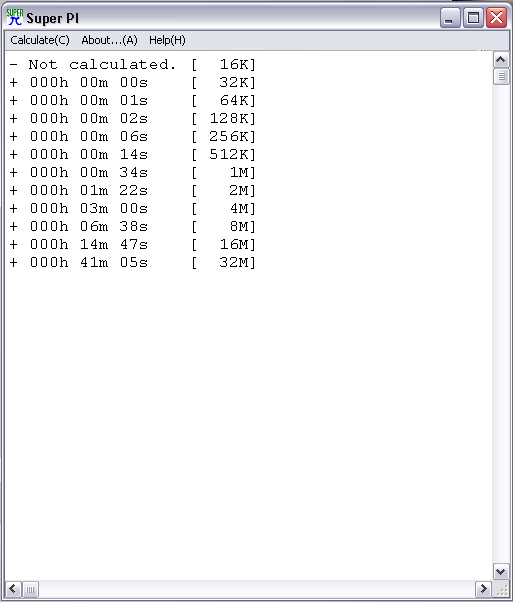 Note - Nothing, but the CPU had been changed in the notebook. There is only a small increase of performance at benchmark test which use a lot of 3D calculations, but a clear increase of performance at CPU intensive tasks. 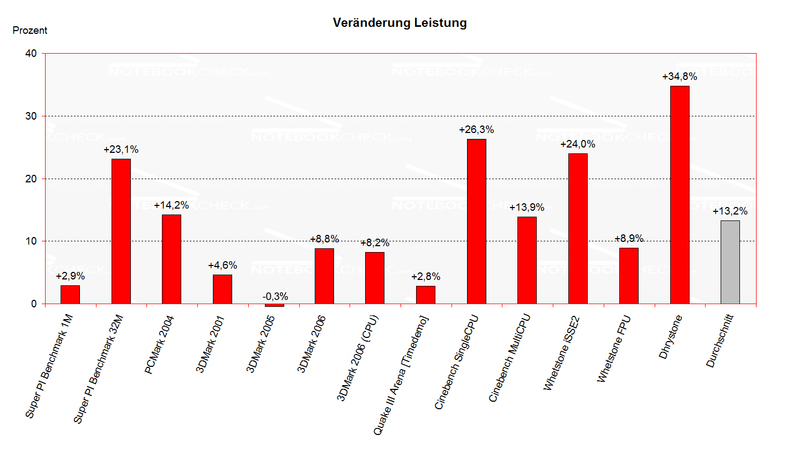 The negative result at the 3DMark 2003 test might be caused be a certain possible tolerance at the performed tests. The results of Super Pi are of special interest. Both processors performed equally well until 16 million decimal places. Only if run at the maximum configuration of 32 decimal places, the Core 2 Duo processor clearly wins and is 23,1% faster. 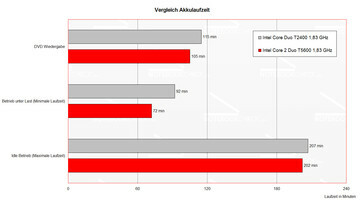 In average the T5600 Core 2 Duo Prozessor was 13,2% better at the performed test. Surely a change of the CPU influences the emissions. As usually, we look closer at the temperature and noise emissions. 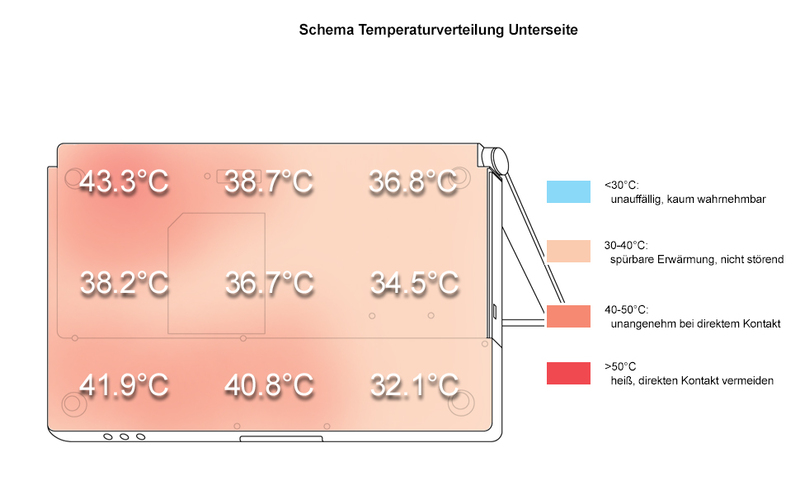 We detected a hot spot at the bottom side, in the middle of the notebook of 44.6°C. 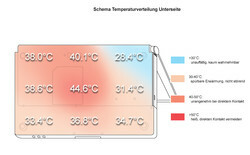 The average temperature at the upper side was inconspicuous at 31.1°C and at the bottom side at 36.2°C. 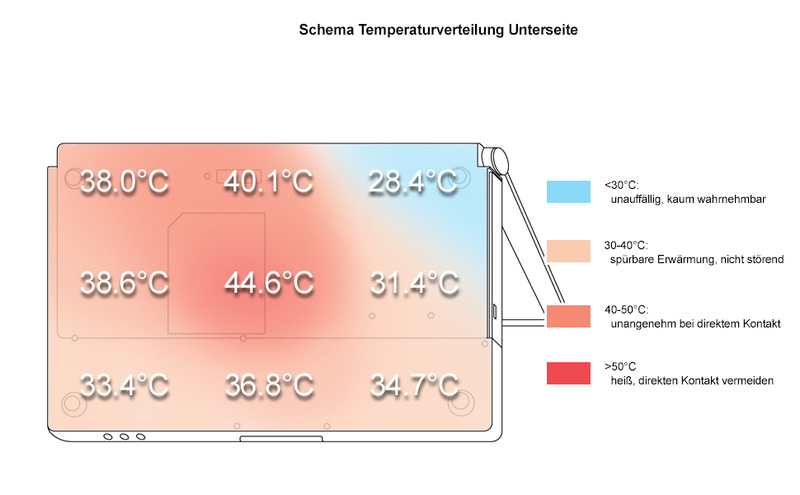 The operation with the Core 2 Duo CPU showed a different temperature distribution at the surface of the notebook. The average temperature at the top side did not change much. 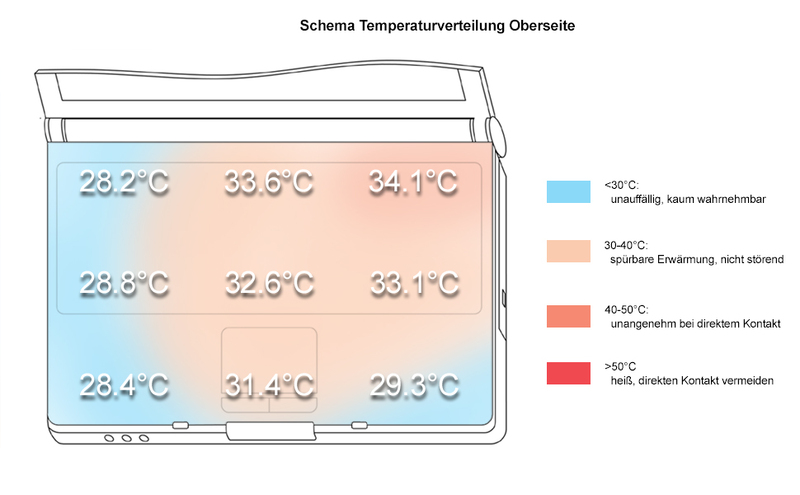 On the contrary, the hot spot at the bottom side moved nearer to the air discharge opening and the average temperature increased slightly by 2°C. 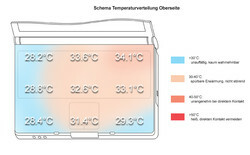 In the contrary to a slight temperature increase, the characteristics of the fans did not change. Maybe this is, because the reviewed notebook controls the fans without the need of a subtle control of the number of revolutions. 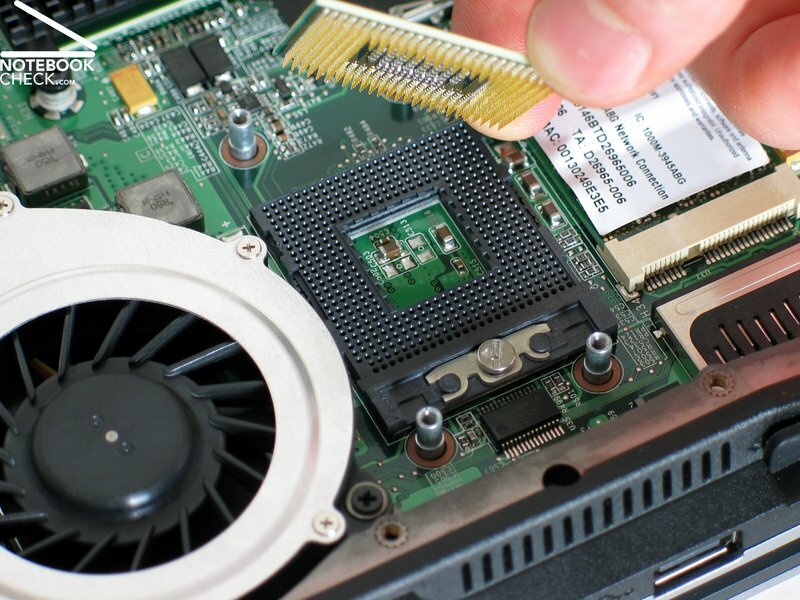 Of course, changes of the CPUs will also result in changes of the energy demands. This aspect can be very import, if a notebook is used mainly mobile. Regarding the energy demand we could measure a clear increase under all loads. At full load there was an increase above 50%. 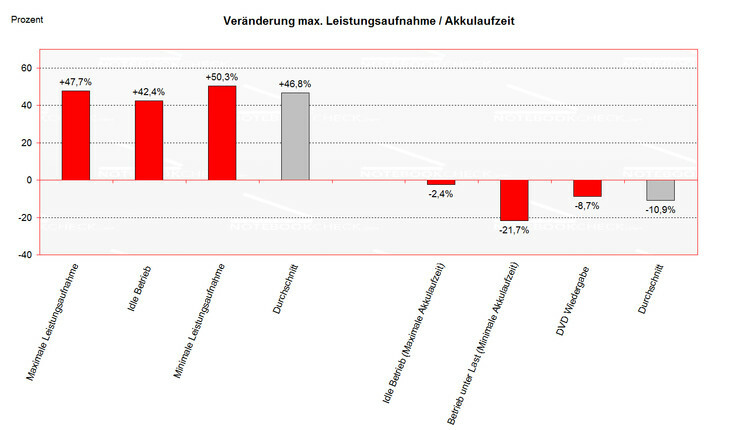 Even the battery runtime clearly declined, because of the increased energy demand. In average the battery runtime declines by 10%. In our review we could measure a performance increase of about 10%. But this observation depends clearly on the application used. If an application makes intensive use of the CPU, one can also observe an increase in performance of up to 25%. 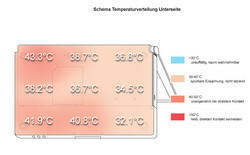 Regarding the emissions caused, one can count on a slight temperature increase and depending on the kind of control of the fans also on a slight increase in noise. 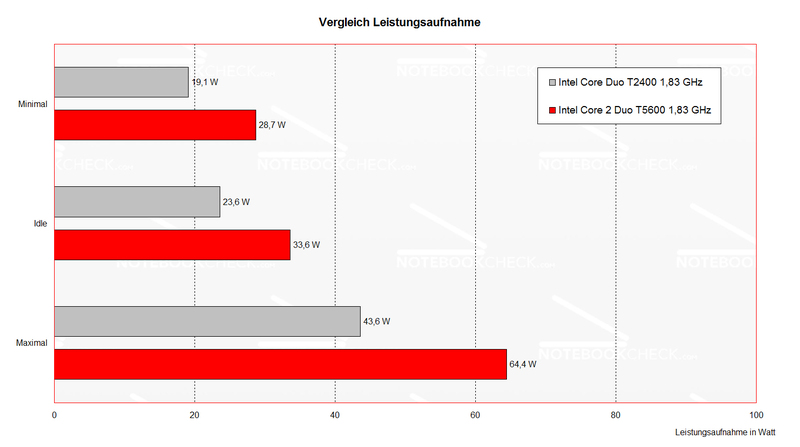 The battery runtime declined, because of the higher energy demand of the Core 2 Duo CPU. In average the battery runtime decreased by 10%. The question rises, whether it makes sense for an user to use a Core 2 Duo CPU. 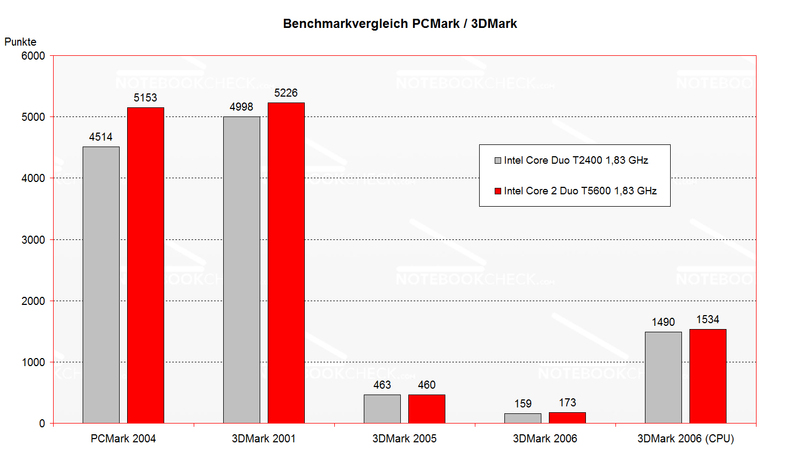 To insist on the new Core 2 Duo CPU is questionable as long as there are still reserve capacities. 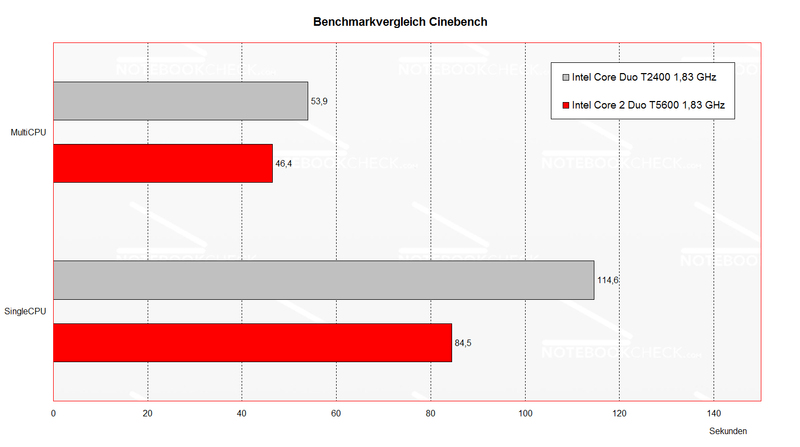 Regarding the price, there is not much difference between the two CPUs. The price difference between the T2400 and the T5600 is about € 250.-. If one considers the current delivery problems and the availability of the Core 2 Duo processors, the Core Duo CPU wins over the Core 2 Duo processor.